Weighting in the Wings F6b y Found this quite hard - haven't done anything for ages so no wonder. In the Blue Corner F6b+ y Quite dirty and not very good. Rip 'em off AB Again F6a+ y One awkward move then just long reaches between jugs. Sadly retro-bolted. Blue Rinse F6b+ Quite how this only gets F6b+ is a mystery - the moves going over the bulge are desperate if you avoid the routes to either side. Are we Mad? F6a y Yes we probably are - quite poor. Phase Two F6c y Hard start and with quite sustained climbing on the upper wall. Fervour and Further F6b y Quite good with a short sharp crux section. Midge Repellant F6b y Hard start and hard finish - this tired me out! Wheels on Fire F6a+ y Pleasant as ever. Subterranean Homesick Blues F6a+ y A good bit harder than Wheels on Fire. Central Buttress F6b y Found this quite easy this time. Drillers in the Mist F6b y Not done this before - one or two thin moves. Flying Horseman F6a y Not done this for a few years. Fone Booth Connection F6b+ y Another one that I'd not done before - steady apart from one thin pull. The Yellow Edge F6a+ y Finally starting to feel tired. Early Riser E5 Just top-roped. Found the start hard and the crux easy!! Tong and Groove F6a y Not very good and quite easy. Joinery F6a+ y Slightly harder but again poor. Debbie Direct F6b y Retro-bolted in the lower half. The Craftsman F6b+ Hard for the grade - harder than most 6cs around here. Took a flyer on the last hard move. Ben Hur F6a y Steep on hidden holds. Fellsman (Revisited) F6b+ Meant to be harder than The Craftsman but really only one hard move. Northern Sole F6a y Pleasantly slabby. Ramp Raiders F6b Nicely sustained. A Block off the old Chip F6a y Quite pleasant but short. Root Sixty Six F6a y Not very good. Vanilla Slice E1 Thin slab climbing. Great Peter E1 y Hard for the grade. The gear takes a bit of getting in. Suspense E2 A couple of very stiff pulls on pockets. Delectable Direct E1 A thin move to gain the supposed crux. Red Wall E1 A hard start but not too easy after that! Puddlejumper F7a A bit much for a warm up! Rose Coronary F7a Cold and pumped from the first route - lots of rests. Hyperspace F6b+ Starting to get a bit damp. Binned it after this - failed to avoid Malham for another year. The Ace of Spades F6a+ y Not very good, don't know why it gets three stars in the guide. Alpine Memories F6b y Decent sustained climbing. Pot Black F6b+ A sustained middle section. Black Jack F6a y Steady but not worth the three stars in the guide. Nebula E1 Just one awkward move to a hidden jug, easy. Jugular Vein E1 y Good and nicely sustained but quite easy really. Moonshine E2 Good climbing but a bit unbalanced with a hard start. Wall Street E1 y Very good but again, easy for the grade. The Arete E2 Very, very good. Again way overgraded. Burger E1 Quite bold in the middle. California Weirdo E2 y A bit of a frig getting the gear in, lowered and did the moves OK.
Alcasan E2 y Windy Buttress lived up to its id! The crag was surprisingly quiet. Dead Banana Crack E1 Not as polished as I seem to remember it. The Unprintable E1 The hard bit is low down but it’s the graunch out over the roof that you remember! ADF F6a+ Just felt awkward again. Barrancos F6a+ y Felt way harder than the stated grade, probably just tired from the three days’ climbing. Elegosentric F6a+ y Really good. Finally starting to feel like I’m moving over rock properly. The Talker Bom F6a y Not as good as the Elegosentric. For once something that felt easy for the grade. No Me Bellcostes la Cuca F6a y Very good and varied climbing. Philedelfia F6a+ y Long and sustained. Definite crux section at the top. Atlantida F6a+ y Quite a bit easier than Philedelfia. Castor F6a+ y Felt a bit scrappy compared to the quality of the previous two. Laconia F6a y Not very good. Ruta Espinosa F6a y Stiff pull to start and a bit awkward leaving the halfway ledge. Serdito Valiente F6a+ y A sharp pull/lurch to begin with then steady away. Felt a bit tired. Mossen F6a+ y More pocket pulling. Revolution F6a+ Quite tired and sore - felt a lot harder than the given grade. Fall Out E1 y Quite easy for the grade - first E1 lead for some time. Butter Arete E3 Should be E2. We just top roped it after Mike and Steve had done the E3 to the right. Crystal E1 Top end of the grade, quite tricky. Taerg Wallt E2 Good climbing, about HVS apart from the move to get to the peg which is desparate when you are cold. Ivy Crack E1 Climbing walls just don’t prepare you for things like this! Mainly a HVS day due to cold weather. Better Late than Never? E1 Unintentional really, meant to do Left Edge. Chip off the Old Block F6a+ y Not very good. 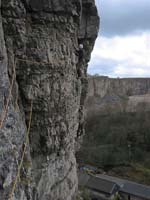 Rib Tickler F6c y One hard hard section. Need to redpoint this. Lazy Day F6b y Quite poor. Has been retro-bolted. Richard of York F6a Failed to lead as I suddenly began to feel tired. Also the sun had gone in so everything went cold. Catman Do F6a+ Probably easier than the previous route.